After 20K miles of DD service and 5 years, my 8mm studs were all tight and hanging just fine. Look up the tensile "yield" of an 8mm stud. Neither mine, nor my brother's 90 turbo wagon had this brace installed. They were both previously owned by turbobrickers though, haha. I am more than convinced. And I believe your theory could be right. I still have to port the straight flange housing out to as close to 3" as I'm comfortable with. My buddy is supposed to come weld up the rest of my exhaust later this week, so I hope to have it buttoned back up very soon. While I was reading last night, I came across an article from a Garrett turbos engineer. Among other things, he makes me feel like I should really be 3" to the back. But I hate to take off this nice tme system. I'm using a reducer that actually necks down to less than 2 1/2". He mentions the further back the reduction is, the better, and it is right before the tme system starts. But still, I am officially putting the rest of a 3" exhaust system on "the list", as money/priorities allow. If it makes you feel any better, I'm planning to run exactly what you have.... a 3" DP to the 3" high flow CAT (sorry to see you are removing yours, I won't do that..... I've got 3 grandchildren). 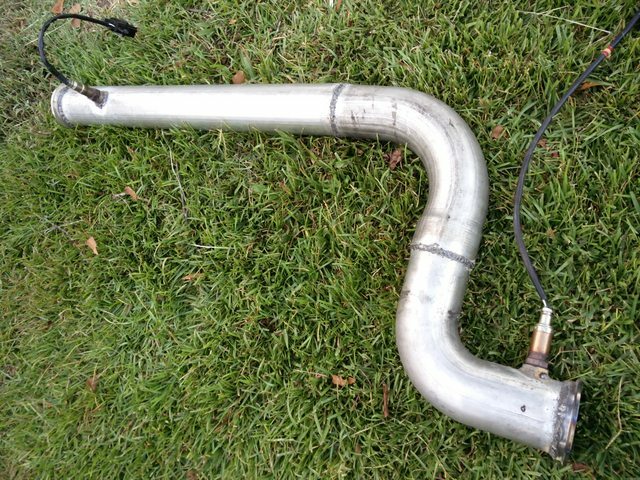 Will have my local exhaust guy custom fab a reducing pipe from the exit of CAT to the TME inlet. I worked on opening the exhaust outlet as much as comfortably possible. This is what about 3 hours with a puny Craftsman drill and some nice bits gets ya. It's probably hard to see in the pictures but it is much more open. Yes, I could have gone wider probably all around, but it's the best compromise for me. I also opened up the inlet at the manifold a good bit also. 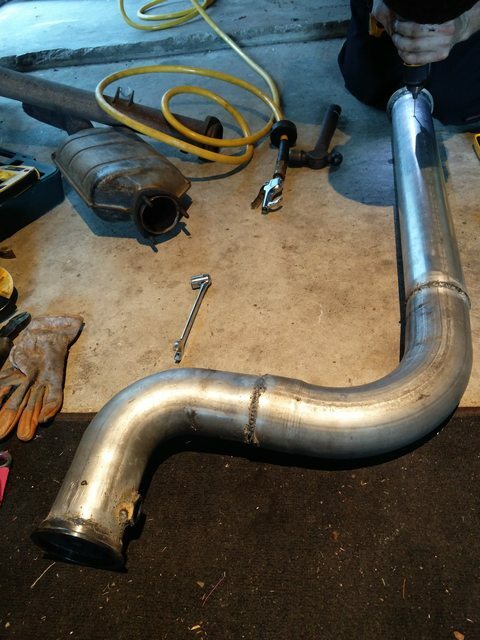 My friend finished up the downpipe. I'm very satisfied for how it came out with my crappy wire feed welder. Here's some action shots. The test drive was pretty rewarding although I didn't push it too hard for the computer's sake. A spark plug wire fell off; that was scary. Also, it's now making much more boost so I need to adjust that. But it spools much more quickly. It sounds a little more throaty but still very quiet. No crazy rattles or anything, although I've still got to make a brace. And the other awesome thing about this is I now have a working wideband. Once lh2.4 settles in, I can start evaluating the need for injectors. And subsequently, more boost. Last edited by soclosenotnear; 09-28-2017 at 09:50 PM..
That down pipe doesn't look too bad, as long as its functional. Did you open up the wastegate port? If you haven't, might as well. It seems fine so far. V band on both ends for ease. 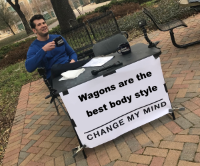 I may add a flex section some day if a brace doesn't satisfy me. I did not open the wastegate port after hearing mixed reviews on the need. I should have smoothed the ramp out if nothing else but didn't. Oh well, it'll come apart again someday. Hopefully I can just drive for a little while. You got it man. It's been fun so far. And if you notice, these boards are now Straight Outta Compton, by way of Sweden. Street credz. Your turbine housing porting looks good. 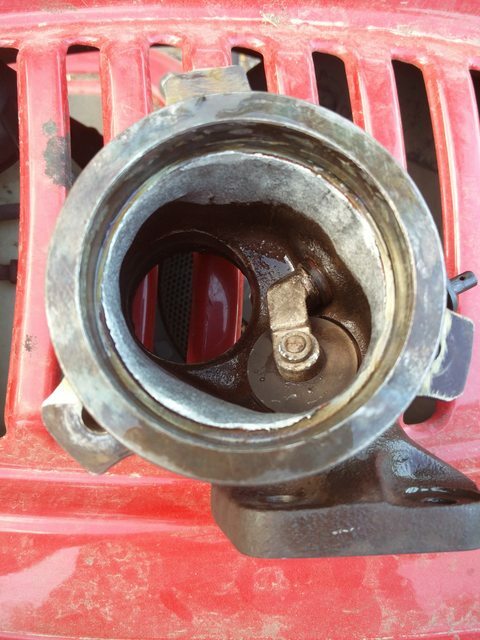 Have you ported the wastegate inlet, between the main gas passage and wastegate valve? 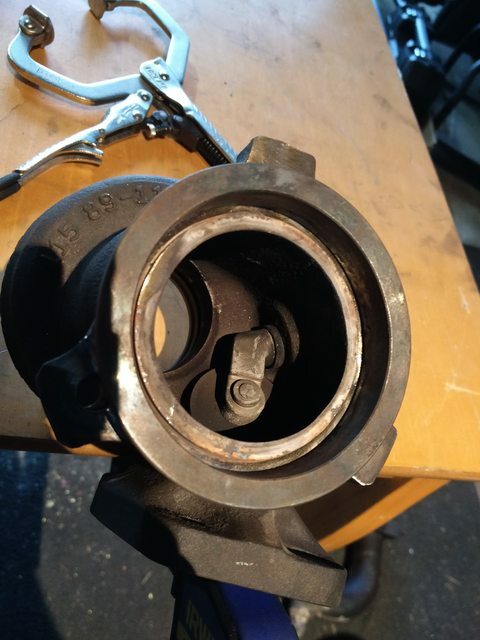 As you open up the housing outlet, and reduce exhaust restriction downstream (like with a nice 3" system), it becomes more and more important to increase the choke flow of the wastegate valve itself. Otherwise you risk boost creep at higher loads and engine speeds. nice work on the downpipe! Thanks. My friend Sam, or MXSlotkin on here, built it for me. What is your recommendation for porting the WG passage? I've heard within 1mm of the actual flapper OD; what I don't care for is the play in the WG swing lever is not a precision mechanism with almost +/- 1mm in the vertical axis. I posted a thread in Performance on this topic and the concensus was to replace the actuator with a Kinugawa so it would fully open the gate. I spent my first few free minutes in a while today adjusting the shift lockout gate thing so first and second were a little easier to get into. I also adjusted the boost controller to exactly the 20 psi I want. Having a wideband now is so nice. The first couple pulls in second had AFR in the 14s. Not good. I'm now looking into injectors. Had to back the boost back down. I'd suggest you back that boost down to 10~12 PSI max, until the fueling is resolved. I backed the boost down as soon as I got back from my test drive. But I haven't driven again to see how much lower it is. I'll work it out to have a reasonable AFR. I'm embarrassed to admit I have no idea what chips I'm running as I've never had the boxes out of the car. Both of the previous owners told me they are chipped, plus a higher rev limit is what I'm basing my assumption off of. I'll be converting to wasted spark shortly, as you know, so ill have them open before long regardless. I do not have a 3" amm and don't want one unless I have to. Im going to figure out what injectors are best for what I'm running and go from there. I kind of figured I'd need more fuel at this point. I ran the 016 2.5" AMM for 5 years, and lived with WOT AFRs of around 10~10.5. So long as you retain the 016, I don't think you will do much better with larger injectors. i ran TLAO 6500 RPM chips in my Jetronic ECU, along with the Buchkaspark wasted spark and a stock EZK. From what I've learned, you won't be able to get decent WOT AFRs until you upgrade to the 3" AMM. I ran the brown tops for almost 4 years and the listed AFRs were the result at around 16 PSI. In the last year before I tore it down for the "last hurrah" upgrades, I put the stock green injectors back in, and the AFRs went back to around 12 under WOT conditions. The danger, is that you are damn NEAR out of injector at that point. If the green tops give out on you, then you could easily destroy your engine, something I doubt would make the wife happy! The guy who posted in your "once and done" thread might have a good compromise in the meantime. Run the suggested 36# injectors, keep the boost down around 12ish, and you might get decent WOT AFRs. From what I've learned about LH2.4, I don't think there is a safe way to elevate to these 250HP+ power levels with the stock AMM. 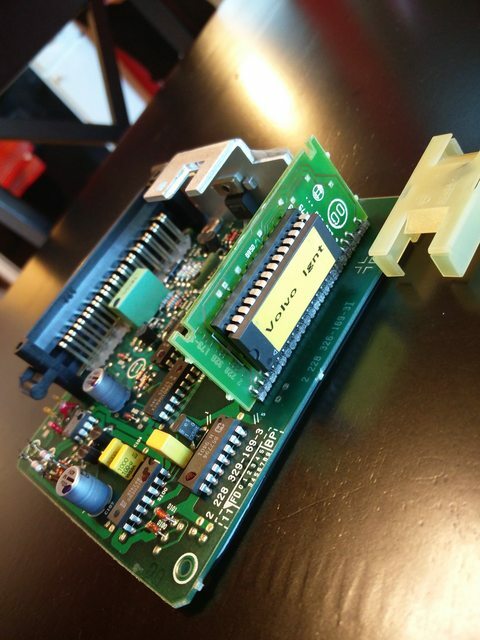 Read thru the original TLAO chip thread and you'll see repeatedly that folks had to upgrade to a 3" AMM to fool the chips and ECU. I opened up my ezk today to start the transition to a wasted spark setup. 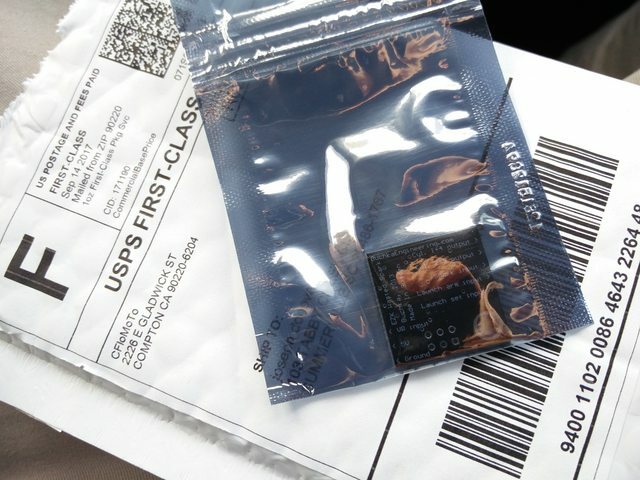 But is this a factory chip or does anyone recognize it? That's good news confirming what I was told about the car. Now hopefully someone has an idea of where they're from. 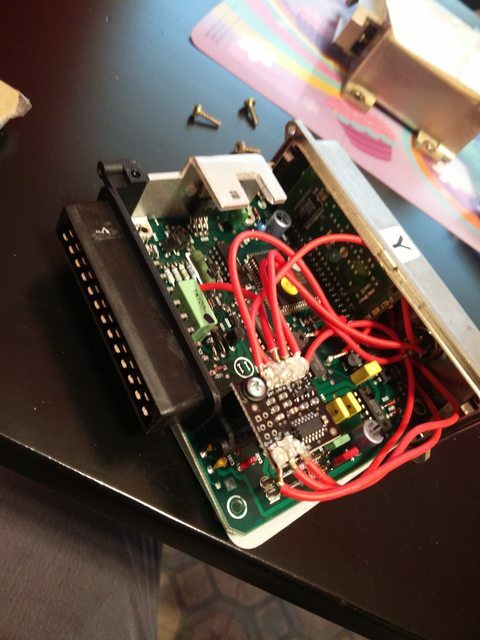 I did my first 15 or so solders in my life to get the wasted spark board wired up. They did not come out pretty but I *believe* it will be good to go. Soldering isn't the easiest when dealing with such small spaces. Hopefully the hot glue will help also. I used an aviation wire connector to leave the ezk box. I think I'm gonna run some wire to where the seat heater switches would have been for launch control, although I'm not going to bother figuring that out just yet. I've got the rest of the wasted spark components to get everything installed so I hope to put it together this weekend. I've been lead to believe I need or will need a 3" -012 amm when I get larger injectors. 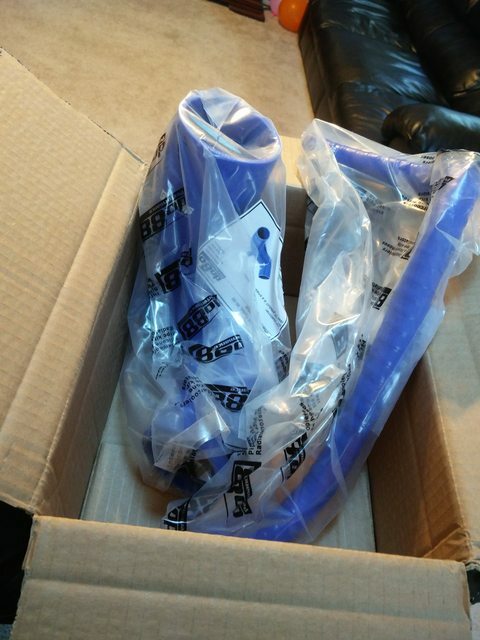 So this prompted an order from do88 since I didn't want to cobble together my intake hose. I grabbed a 3" intake hose and their new pcv hose while I was at it. I think I've got their entire catalog at this point . My pcv hose was cracked in pieces inside of the foam cover thing so a new one was in order anyways. I thought I might have had an 012 amm laying around but I can't seem to find it right now. Has anyone rigged up a 3" amm to the factory air box? Last edited by soclosenotnear; 10-19-2017 at 07:02 PM..
What size wire did you use to solder up the WS board? It only needs to be 18 to 22 gauge.... this is TTL (logic) circuitry, there is NO current to speak of in these wires. They strictly provide the control signals out to your "Power Stage" where the transistors do the REAL work in your ignition system. Are you going to use the 203 BOSCH power stage, or go with another setup for your WS? Regardless, if you use a BOSCH, make sure that you install it in the original heat sink. These things get crazy HOT in operation, and you need the cooling to the heat sink so your power stage will survive long term. There is a specific heat transfer paste that needs applied to the back of your Power Stage, in order for the heat to be transferred to the sink.... look it up, I think NAPA can order it. 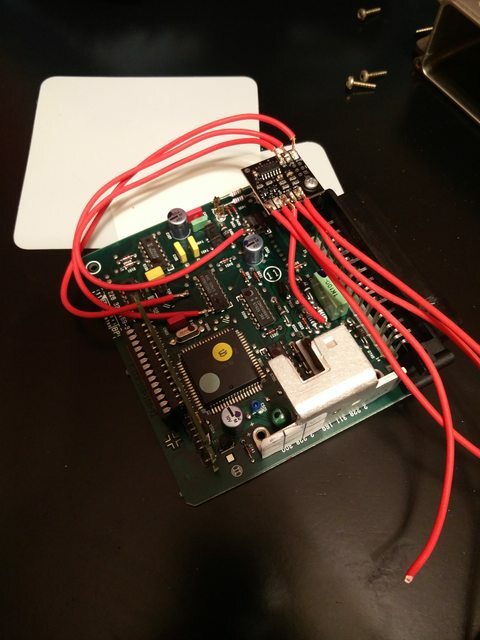 I used 16 gauge wire for the board as that is what (i thought) I saw recommended in the giant wasted spark thread. I am using the Mitsubishi j702t power stage from a Miata. I hadn't read any mention of heat sinks or paste in that thread, but I could just be forgetting. I'll look into it a little more. I reread through that thread and see no mention of it, other than what you've posted in it in the past. I searched for images of how mine was originally mounted in Miatas, and it seems to just bolt to a bracket? Last edited by soclosenotnear; 10-21-2017 at 11:59 AM.. Spent a half hour or so tinkering today. I got the other side of the connector soldered up and mounted the ezk. That third screw is awful. I ran my two wires through the driver's side firewall. 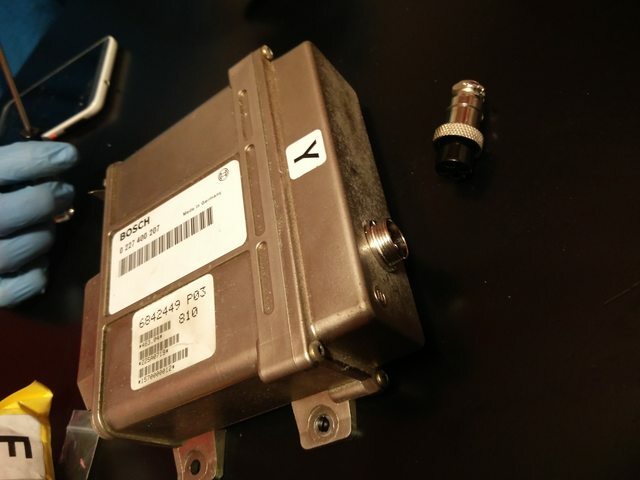 My goal is to mount this j702t ignitor where the factory one sits with some sort of heat sink. I'd like to rig up a bracket for the Bosch 2x2 coil in the factory 240 distributor position. That way I can use 240 plug wires. This idea is courtesy of Duder, but his bracket won't work in a 7/9. What gauge wiring where for everything else? You can see in my build thread, the method I used to mount the Bosch 2x2 coil near the firewall, atop the valve cover. Range Rover "twin coil" mounting bracket, cut down and then using MISUMI standoffs that are the matching thread size to the valve cover studs. You don't have to use those standoffs, but the coil is fairly deep and will not flat mount to the valve cover. I chose not to hang the coil off the strut tower as some did in the WS thread (pics likely all gone now, Photobuggered), as I didn't want the turbo heat soaking it. Check with Range Rover folks, the guy I bought from was near Columbia SC and sells on eBay. You can of course mount in the original coil location (heat soak protected, bless their hearts) but will need to buy some LONG plug wires. Do you have the proper coil connector to land your wires to it? Just match that gauge if you got a factory connector. Worst case, NO larger than the blue/red wire on the stock coil. Yup, I bought all the proper connectors to give my self the best chance at successfully making this work, ha. That makes sense about simply matching the wire size that I've already got. And I'll dig through your build thread and take a look at your install. I'm sure it's as well documented as everything else, so thanks again. Thanks for the response. For some reason, I was thinking the factory igniter thing was fixed to the heat sink, but that's good news. A picture would be great, but that makes sense and sounds like an easy solution.